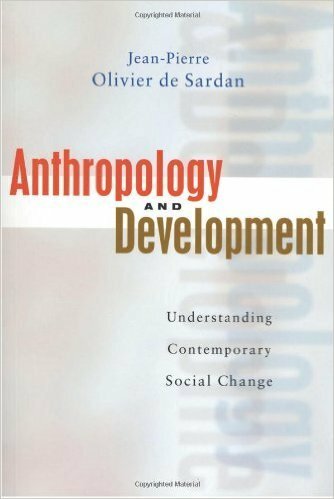 Olivier de Sardan J.P., Anthropology and development, understanding contemporary social change, London, Zed Books, 2005, 256 p.
This book re-establishes the relevance of mainstream anthropological (and sociological) approaches to development processes and simultaneously recognizes that contemporary development ought to be anthropology‘s principal area of study. Professor de Sardan argues for a socio-anthropology of change and development that is a deeply empirical, multidimensional, diachronic study of social groups and their interactions. The Introduction provides a thought-provoking examination of the principal new approaches that have emerged in the discipline during the 1990s. Part I then makes clear the complexity of social change and development, and the ways in which socio-anthropology can measure up to the challenge of this complexity. Part II looks more closely at some of the leading variables involved in the development process, including relations of production; the logics of social action; the nature of knowledge; forms of mediation; and ‘political‘ strategies. Following its successful publication in French, this important book will provoke much thoughtful debate within Anthropology, Sociology and Development Studies.